When I walked into the ‘Rise of the Guardians’ screening, I didn’t quite know what to expect. It could have gone either way for me. Luckily, it went a good route. I was surprised by how much I enjoyed it, mainly due to the unorthodox versions of these characters we have come to know through out the ages. 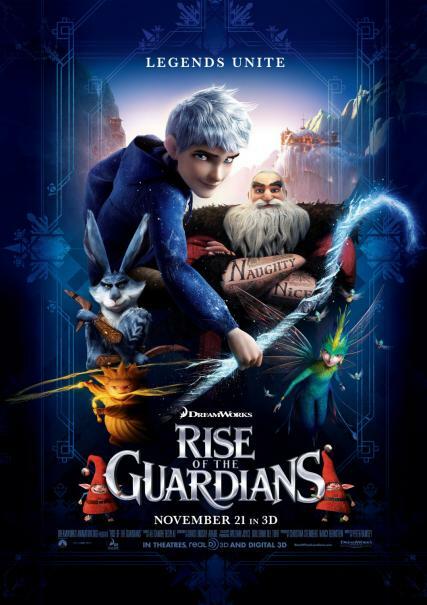 Not only will ‘Rise of the Guardians’ play to the young ones, but adults will have a fun ride with it too this holiday season.DreamWorks Animation did a bang up job with this project. 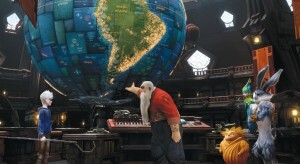 Based on the book series ‘Guardians of Childhood’ by William Joyce and the short film ‘The Man in the Moon’, ‘Rise of the Guardians’ is more like ‘The Avengers’, but instead of Iron Man, Hulk, Thor, Captain America, Black Widow, and Hawkeye fighting evil; we have Santa Clause (Alec Baldwin doing a fun Russian accent), E. Aster Bunnymund aka the Easter Bunny, who is a skilled ninja (Hugh Jackman), The Tooth Fairy, who is part humming bird (Isla Fisher), The Sandman, a mute short and stubby gold guy, and the main ingredient Jack Frost (Chris Pine). You immediately know that these characters are not the norm that we see every year, as Santa Clause, or as he is called ‘North’ is fully tattooed and is a strong and powerful leader, rather than the tubby jolly guy we all know. Clause has ‘Naughty’ tattooed on one arm, and ‘Nice’ on the other arm, and come to find out that giant Yeti’s are responsible for making toys, not elves. The Easter Bunny stands on two feet and dons boomerang weapons and his ninja like skills. He is the Bruce Lee of the bunch. The Tooth Fairy has wings and looks like a humming bird, and has millions of little tooth fairies that help her with the teeth collecting. I rather enjoyed seeing the tooth fairy getting all excited when she receives a tooth with tons of blood and gum on it. The Sandman is more of the magic man, with powers to create objects and animals with sand. Then we have Jack Frost, who is much like Peter Pan in my opinion, a free spirit who wants to have fun all the time. Only problem is that kids do not know who he is and don’t believe in him, which is the constant source of dread in this film. Frost is also plagued by a terrible accident that happened 100’s of years ago to which he can’t fully remember. The guardians try to enlist the help of Jack Frost, to fight the return of the evil ‘Pitch’, short for ‘Pitch Black’ , which is the Boogie Man (Jude Law). Pitch has returned from a long absence wreak havoc on Earth’s children by bringing darkness and nightmares to them eventually hypnotizing them into not believing in Santa and the others, which will lead to their doom. It’s up to the Guardians to put a stop to Pitch before it’s too late. Pitch Black is the stereo typical bad guy. He is tall and lanky and dressed in black fully. He actually resembles Lord Voldemort from the Harry Potter series, and even his magical skills of summoning evil looking horses resemble a mix of the death eaters and the black horses of the ring wraiths from ‘Lord of the Rings’. I thought Pitch was decent, but seemed a bit cliche and unoriginal. He was definitely the worst character out of the group. Everybody else was a lot of fun to watch. ‘Rise of the Guardians’ is the first major feature film for Peter Ramsey to direct, who was formally a storyboard artist for a ton of epic films. Look at his resume of films he has storyboarded and be amazed. However, the only other film he directed was a TV movie called ‘Monsters vs. Aliens: Mutant Pumpkins From Outer Space‘, a film I need to see immediately judging by the title. That being said, Ramsey did a phenomenal job of keeping this a fast paced film, with tons of striking visuals, good dialogue, and great characters. This film is in 3D, and was a good film to see in the format. Since Jack Frost can fly in the film, there are tons of shots where the camera flies with him through crowded streets, dodging objects left and right. The 3D came in handy here. So I recommend that if you have the option to see this in 3D, do it. And Alexandre Desplat’s score was very good too. It brought the right amount of extra emotion to each scene. You might recognize some of familiar tones from Desplat as he worked on films such as the last two Harry Potter films amongst others. 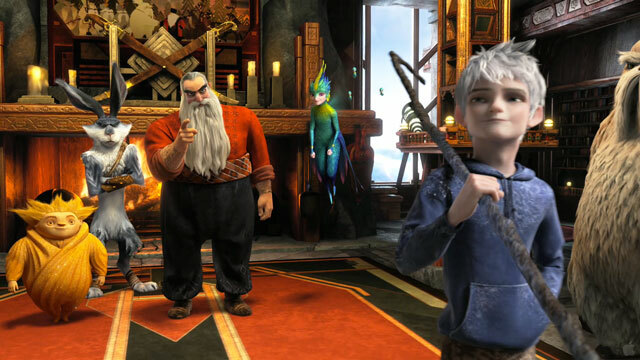 ‘Rise of the Guardians’ was a fun film with great characters. And the kids will definitely believe in these characters after viewing, even Jack Frost. And I’ll be honest, I’d watch a sequel to this film. Film Review: ‘The Secret Life of Pets’! This entry was posted on Monday, November 19th, 2012 at 11:29 am	and is filed under Film, News. You can follow any responses to this entry through the RSS 2.0 feed. You can skip to the end and leave a response. Pinging is currently not allowed. « Geek Deal of the Day! ‘Breaking Bad’ Seasons 1-4 Blu-rays are $11.99 Each! Cheapest Ever! They don't call it a Quarter Pounder with cheese? Then what do they call it? A Royale with cheese. What do they call a Big Mac? Well, a Big Mac's a Big Mac, but they call it le Big-Mac. Le Big-Mac. Ha ha ha ha. What do they call a Whopper? I dunno, I didn't go into Burger King.